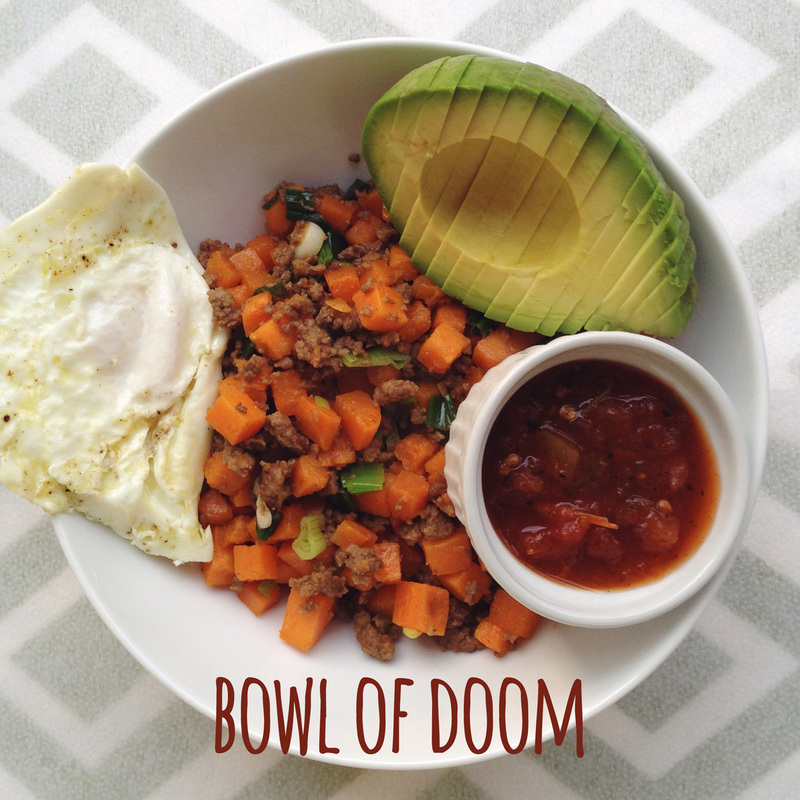 I first experienced the Bowl of Doom in a tiny restaurant in Dallas, Texas called Kozy. It’s actually an secret menu item at the joint that a friend recommended to me. It’s 100% paleo. 100% delicious. And 200% protein. Loads of protein. And I guess that’s why it earned the name “Bowl of Doom”. However, protein-filled as it is, it doesn’t make you feel icky after eating it. It’s delicious. I highly recommend you give it a try. Experiment with it. I just bet you’ll make the Bowl of Doom a frequent menu item at your house. 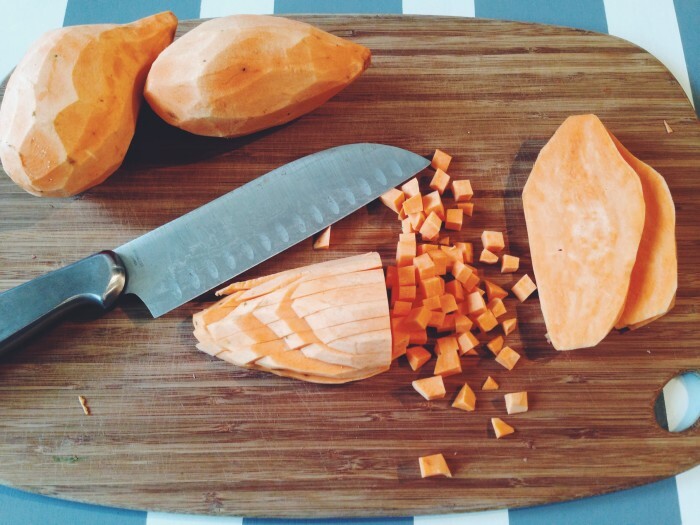 Peel the sweet potatoes and cut them into cubes. I try to keep them peanut-sized so they cook quickly and match the size of the ground beef bits. Once they’re cubed, heat a skillet or wok over medium-high heat. Glob a spoonful of coconut oil into the pan and add the sweet potatoes. Season them with 1 teaspoon of salt. Cook them until they’ve softened a bit, stirring frequently. They should still be hard enough to maintain their shape, but soft enough that they’re palatable to eat. Transfer the cooked sweet potato cubes to a bowl, then use the left over oil to brown your ground beef. Season the beef with 1 tablespoon of cumin, 2 teaspoons of salt, and 2 teaspoons of garlic powder. While that’s cooking, chop your green onions. Also, heat up another pan so you can cook your eggs. Once the beef is browned, add your green onions to the mixture and cook for a couple more minutes. Then add your sweet potato cubes. Cook it until you start seeing the beef get a little bit crispy (not too crispy). Then set it aside. Cook two (or however many plates you’re preparing) eggs however you like. I prefer mine over easy so the runny yokes can mix with the rest of the bowl. Cook them in olive oil with a little salt and cracked pepper. Then cut an avocado in half, peel it, and slice it. Finally, put some salsa (this is the kind I use) in a tiny bowl and assemble your bowl of doom. It’s best eaten when it’s all mixed together, but it’s best served separately. Then enjoy it! Note: You’ll have enough meat/sweet potato mixture leftover for a doggy bag to take to work with you. This looks so delicious! I love avocados and sweet potatoes! This. Looks. AMAZING. I don’t know if I could eat half an avocado all in one sitting, but this combination looks killer enough to try–that would fill you up for ages! Also loving the ‘reluctantly paleo’ theme here, it’s awesome that you support your wife’s tricky diet! Will be checking back in here from now on! My husband has been requesting high protein meals lately, so I’ve been hunting for something we would both enjoy. I was a little reluctant to make this because it isn’t like anything I typically pick. However, I am so glad that I gave this a try. This was absolutely delicious!! My husband raved about it,and my picky two year old even enjoyed it. I most definitely will be making this again and again. Thank you for sharing!! I cannot stop making this, it is soon yummy! Made this today! Nice and easy and delicious! thanks! This is absolutely going into this week’s meal plan. It looks wonderful! 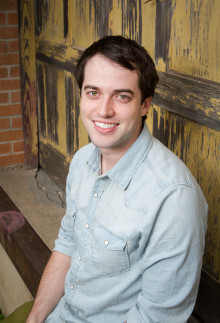 Hi Jonathan, How are you? We would like to inform you that we shared basic recipe information in our page http://mindwhale.com/bowl-of-doom/ for our clients/customers and visitors to see more healthy recipe that we recommend them to cook to have a healthy brain. For our clients to see the complete recipe details, a link is included so they will be directed to your recipe page. Delicious! What a fabulous recipe. Thanks so much for sharing it! This is dinner tonight (and probably lunch tomorrow). I can’t wait to try it! This was amazing! I don’t really like cumin and didn’t have green onion, so I sautéed a garlic clove and half a medium onion with the beef. I also felt like the sweet potatoes were taking a while to cook and my 4 year old was hungry, so I microwaved them for 2 minutes after sautéing them for about 15. Added the egg and the avocado and it was just delicious!!! This recipe is delicious. We found something similar at a little diner/grocery store north of sedona. They serve theirs with quinoa mixed in so that’s how I always make this, as well. Delicious! Is the recipe posted for 2 servings or more? It’s probably about 3 or 4…depending on how much you eat. For my wife and I, it’s about 3. WOW! This is delicious! I made it tonight. I’ll definitely be looking around your website for more good recipes! LOVE, LOVE it! Husband raved over dinner! Thanks a million! This is so mouthwatering delicious! I’ve made it once before and can’t wait to make it again tonight! I didn’t have any salsa the last time and it was still outstanding. You spend the most time on prepping the sweet potatoes. Amazing,quick, and simple meal. Meets all my requirements! I made this for lunch today and really enjoyed it! I used yams instead of sweet potato. The flesh is a lighter color and not as sweet. Just a personal preference. I didn’t eat it with an egg this time but I enjoyed the pairing with the avocado which added a fresh side to the fried potato and meat mixture. I’ll definitely make this again and go a little bit easier on the salt, choosing to salt after it’s been cooked. Thank you for an easy and tasty recipe! I was unsure of what to expect with this combination of ingredients, but wow!!! I can’t believe how well everything complements each other! Will be making this often! Made it. A little heavy on the sweet potato – I ended up using half of what I cubed (and they weren’t huge sweet potatoes, either). Delicious. I will make again. Although I have never tasted this food, love the way it looks, I have to try it. There is a Mediterranean restaurant by where I live and they have something that looks like this, but when I asked the owner if it’s bowl of doom, he said he had never heard of that word. Thanks, will let you know how it goes. Im doing this recipe. Love sweet potatoes, and need something for lunch…i have long work days. Excited too try it out, thanks. Husband is always wary of me trying new recipes…but he dug into this dish and didn’t stop till it was all gone! Its a keeper! Having left overs for my lunch today!